Madurai: A team of more than 20 dosa masters joined hands today to make the world's longest dosa, measuring a serpentine 48.25 ft, which found a place in the Guinness Book of World Records. The record-breaking crew, led by renowned chef Damoranan, known as Dhamu, broke the previous record of the Vijayawada Hotel owners Association, who had made a 38.2 ft long dosa. "We spread the longest ever dosa - Guinness dosa today," Damodaran, who was assisted by 20 dosa masters in the effort, said. The feat was achieved as part of the food festival organised at the Tamukkam Ground here by the Madurai Rountable 14 in association with Ladder Commercial Solutions, a Chennai-based event management company, and with support from Madurai Hotels' Association. The event was held to raise funds to support government schools and orphanages. As part of the feat, a 61-ft dosa pan had been made and fitted to a special steel table. The weight of the pan was 900 kg, Satish Devadoss, one of the organisers, said. 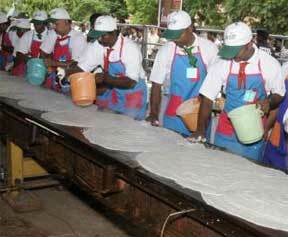 The organisers started using the 61-ft dosa tawa by rolling out dosas for visitors yesterday. The final spread was done as per Guinness specifications. Officials from the Guinness Book of World records were present when the dosa was made, Devadoss said. The burners for the huge dosa tawa were manufactured and brought from Chennai while three dosa tawas, each measuring 20 ft each, were fitted here. The total weight of infrastructure involved in the event including table and pan burner was 4,000 kg, Devadoss said. The huge quantity of batter required to make the Guinness dosa, about 1,500 kg of it, was provided by Hotel Temple City. Besides the 20 dosa masters aiding chef Dhamu in the effort, experts and students from catering colleges also joined the event.